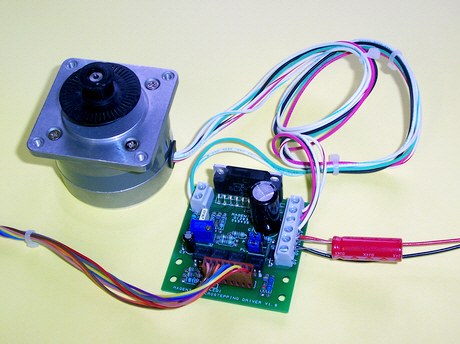 Published in EPE Magazine May 2009 issue, this 4 Phase Unipolar Stepping motor driver provides up to 1/16 microstep operation - giving 3,200 steps per revolution for a standard 200 step motor. Links also allow selection of 1/2 1/4, or 1/8 step mode. 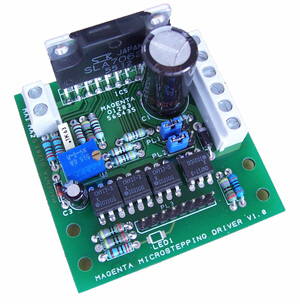 Uses the Allegro SLA7062M PWM controller chip to give adjustable current up to 3A per phase (adjustable by on board preset), and 10 to 40 Volt operation. All Inputs opto-isolated suitable for operation from standard logic circuits and compatible with standard computer I/O ports (LPT). Minimum application just requires Clock and Direction inputs. An optional third input provides Sync mode to reduce PWM noise in some conditions. An output signal indicates when the motor logic is in a 'home' state to provide useful feedback to the driver logic controller or computer. Example computer port connections and simple (slow speed) demonstration software download available. Kit supplied with assembly instructions - and detailed description of the circuit.